. Nanafushigi, nana fushigi 七不思議 "The Seven Wonders" of Japan . 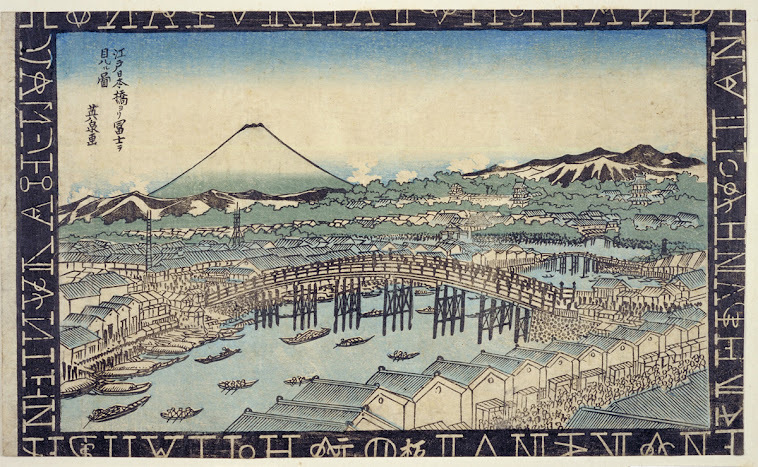 There were quite a few places with "seven wonders" in Edo. .Takizawa Bakin 滝沢馬琴 (1767 - 1848) - Writer . - A women had laid chicken eggs. - A baby drowned in a 桶 water basin. - After a 和睦 peace treaty someone had a sword wound. and lost his eye on the visit. - A Raiju Thunder Beast Yokai Monster had been caught!
. raijuu Raijū 雷獣 Raiju Thunder Beast Yokai . sakasa ichoo 逆さいちょう "the upside-down gingko tree"
. 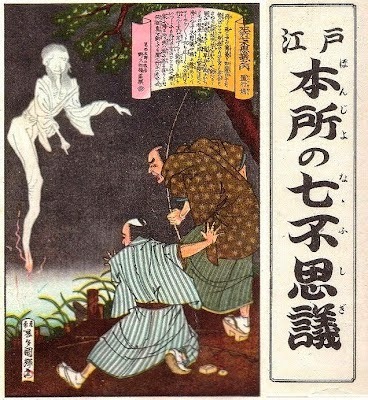 mamiana no kodoo 狸穴(まみあな)の古洞 "hole of a Mami badger" . Several legends surround Ippon-Matsu, for example, it is also called "Kanmuri-no-Matsu" and "Shugetsutei-no-Hagoromo-no-Matsu." There is also a common belief that offering sweet sake in a bamboo cylinder to the tree will help cure a cough and the tree is called one of the seven wonders of Azabu. These legends and superstitions are thought to stem from the belief that gods resided in the giant trees lining the old roads. Today's pine trees were planted by the local community association after the war. Ippon-matsu-zaka, named for the lone pine tree. At the top of Ippon-matsu-zaka stands Hikawa-jinja (shrine) dedicated to Bishamonten (god of war). ..... nestled in a quiet corner of Moto-Azabu in Tokyo’s Minato Ward, about a kilometer south of Roppongi Crossing. Gama-ike covers only 660 sq. meters, but it is spring-fed (a rarity in Tokyo) and plays an important role in the Azabu Plateau water system. 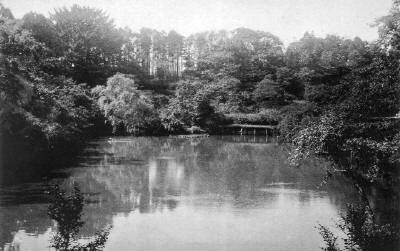 The pond was not always so small. At one time, Gama-ike covered more than 10,000 sq. meters, but years of reclamation have taken their toll. Today, the pond is a shrunken version of its former self. The name, too, has loftier origins. Gama-ike was once part of the estate of Yamazaki Chikara-no-suke, an elite samurai who served the shogun during the Edo Period. Legend tells of a huge bullfrog that lived in the pond and once used its wet, icy breath to stop a fire from razing the neighborhood. Gama-ike is listed as a cultural treasure of Minato Ward.
. Azabu district 麻布 "hemp cloth" .
. Bakurocho Nana Fushigi 馬喰町七不思議 .
. Kōjimachi 麹町 / 麴町 Kojimachi district and 番町 Bancho .
. Hatchobori Nana Fushigi 八丁堀七不思議 .
. Honjo Nana Fushigi 本所七不思議 Seven Wonders of Honjo . 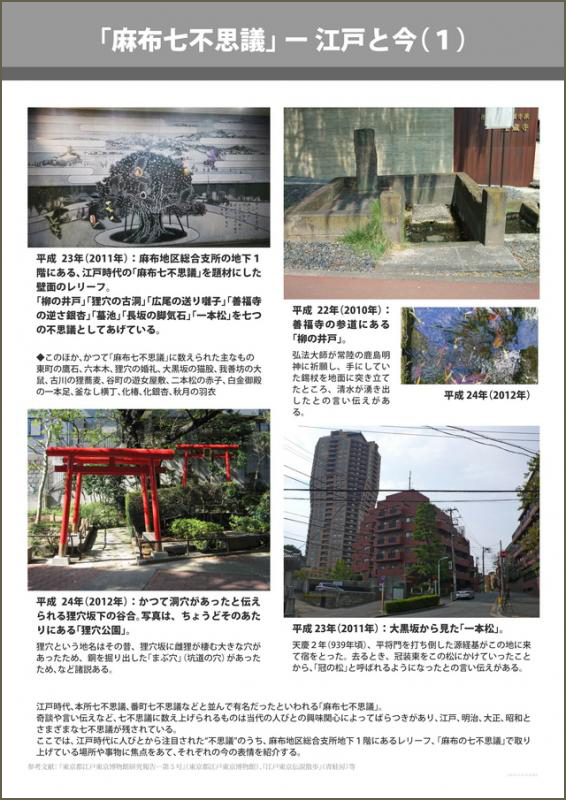 "Water Specter in Edo - Seven Wonders of Honjo"
edited by second-generation Tanehiko Ryutei. 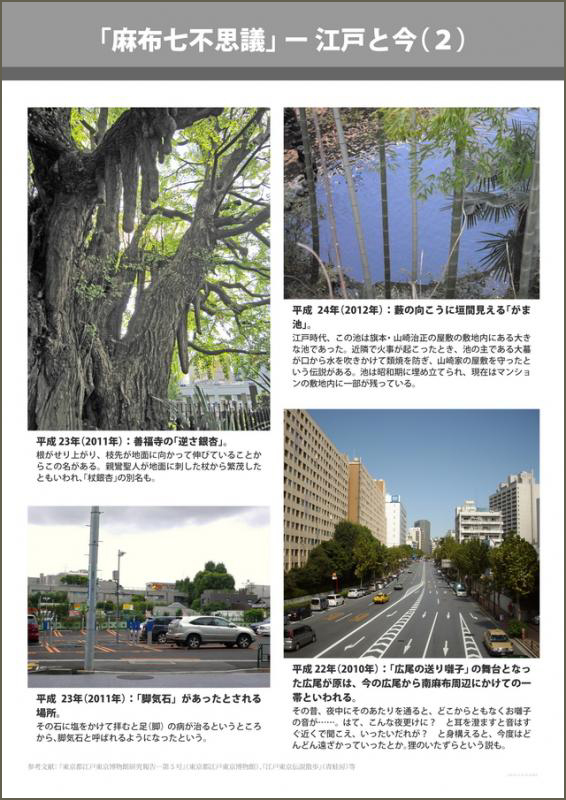 Depending on the document, contents of seven wonders differ, besides "Oitekebori" and "Katahano Yashi".
. Reiganjima 霊岸島の七不思議 seven wonders of Reiganjima .
. Oman enoki おまん榎 hackberry tree of Lady O-Man . The temple Tokai-Ji is located in Shinagawa. 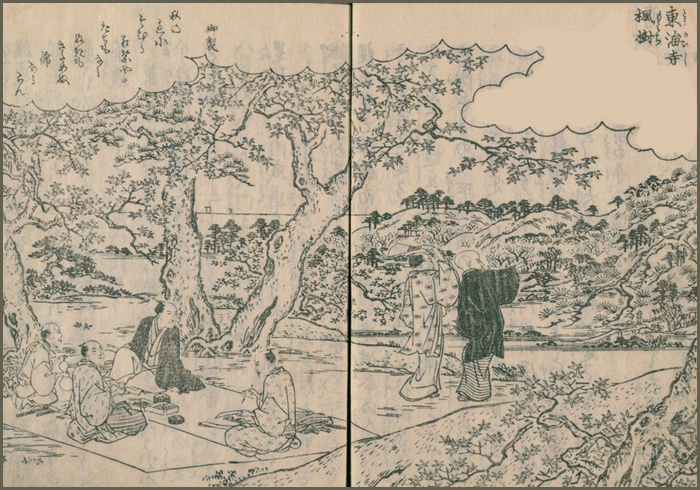 It was dedicated by 徳川家光 the Shogun Iemitsu to his advisor, the famous priest 沢庵和尚 Takuan. His grave is in the temple compound. 鳴かぬ蛙 / 鳴かないカエル Frogs that do not croak. There are many in the large pond, but since one day when they were so lound, priest Takuan shouted at them and scolded them, so they shut up for good. 片身の鱸 / 片身のスズキ A sea brass with one eye. Once priest Takuan went to the kitchen and found the cook preparing a sea brass, having cut out one eye already. Takuan took the poor animal, shouted a powerful 「喝！ "KATSU!" at it and threw it back in the pond. The fish soon regained its strength and stayed at the back of the pond, protecting the waters and the temple. A gingko tree in the compound grows its nuts only on one side of the tree. 潮見の石鉢 / 潮見の石 / 潮見の水鉢 A stone water basin that knows the tide. The big stone basin begins to fill with the tide and water recedes with the ebb-tide. 血の出る松 / 血のでる松 A bleeding pine tree. Near the entrance gate is a huge pine tree. But it was in the way when the Shogun wanted to visit the temple, even called じゃまの松, "the pine in the way" - and it was decided to cut it down. At the first cut with a saw red blood begun to flow from the wound and the arm of the woodcutter became stiff. Now the temple priests knew this was a special tree they had to protect. The wound from the cut is red to our day. 火消しの松 / 火消しのビャクシン A mountain juniper extinguishing a fire. 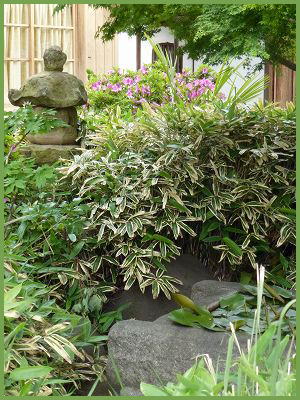 At the back of the temple garden was an old tree, which had come all the way as a present from the temple 金山寺 Kinzan-Ji in 唐（中国） China. One night priest Takuan woke up and called out: "There is a fire at the temple Kinzan-Ji!" All the priests got up in a hurry and begun to douse the tree with water, praying to help the temple in China. A while later came a present from Kinzan-Ji, expressing greatfulness for helping to extinguish the fire. 千畳吊りの蚊帳 / 千畳づりの蚊帳 A mosquito net the size of 1000 tatami mats. The temple 金山寺 Kinzan-Ji sent a present of a box with a mosquito net in a paulownia box. The net was rather large, maybe the largest at this time . . . but maybe not quite the size of 1000 tatami mats ?!
. Takuan Sōhō 沢庵 宗彭 (1573–1645) Priest Takuan . A place where people came to enjoy the colored leaves.
. Yoshiwara 吉原　pleasure quarters in Edo . There is a "great entrance gate", but no entrance porch. The moat around it is called "riverside", but there are no boats. There are shops called "tea stalls", but they do not sell tea. The servants are called 新造 shinzo "Young Woman" , but most of them are old hags. There are servants called 若い者 wakai mono "young men" , but most of them are old and bald-headed. There are female managers called yarite 遣手 "spenders", but you can not lay hands on them (toru).or take money from them. There are "water ways", but there is no water. Gangs of firefighters: wore water symbols (carp, dragon). Kumi identification. Soon spread to other service classes. 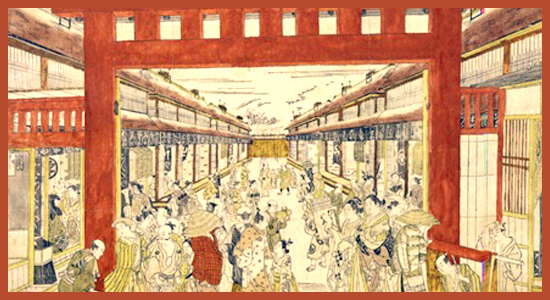 One of the “Seven wonders of Edo” was “an artisan without a tattoo”.